I believe that the contents of this book will offer hope, help, and encouragement to those who are overweight and want to lose weight, to those who have high blood pressure and want to lower their blood pressure, to those who are tired much of the time and want more energy, to those who have health problems and would like to get well, and to those who want to avoid sickness and disease and enjoy a better quality of life. I want you to view this book as a testimony and not a prescription. I do hope that this information will cause you to think for yourself, accept responsibility for your own health, and challenge you to do additional reading in this field of study. It is very easy to document what I write in this book. Most of this is not new but it is contrary to popular opinion. I am not a doctor nor am I the son of a doctor, so why would I write a book on health? For over thirty-five years, I have been very concerned with how to obtain and maintain good health. I wanted to avoid sickness and feel good so I could carry out my very important ministry that was helping thousands of people. I wanted to enjoy my life, my family, and my ministry. I was also very concerned for relatives and friends who have health problems. For these reasons, I have read many books on health and nutrition. I have listened to many lectures, courses, and seminars on tape by nationally known authorities in the field of health and nutrition. I have also memorized most of the verses in the Bible that deal with sickness, health, fasting, and the body. I have applied most of this information, and over the years I have enjoyed very good health. The few times that I have been sick were because of food poisoning that I received from bad food I ate in restaurants or in other countries. I recovered very quickly because I knew what to do. Likewise, I have shared this information with others who have experienced unbelievable results when they applied this information. Some of these stories are recorded in this book. I do not claim to be an authority on health or nutrition. I am not trained or licensed to prescribe for you. I only want to share with you what I have learned about obtaining and maintaining good health and how my family, friends, and I have benefited by applying this information. Modern medicine, as practiced in America today, is concerned primarily with surgery, radiation, or prescribing drugs that will remove the symptoms but many times do not deal with the real cause of the sickness or disease. This is why the disease often recurs unless the person changes his diet or life style. 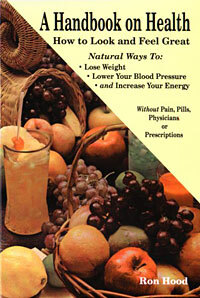 In this book, I am not dealing with medicine, but with prevention and how to obtain and maintain good health. The things that I recommend in this book are not dangerous but are very easy for you to test for yourself. You can experience the benefits very quickly. You may be tempted to discount what is taught here because you do not have to join anything, buy expensive drugs, or pay high fees to doctors or hospitals. You might think this is too simple to be true. Please do not prejudge and discount these simple truths until you have tested them for yourself. This could make the difference between life and death, sickness and health. You owe it to yourself to “check it out.” If paying will make you feel better, I will accept your money. This book is not intended to be used as a text in a university classroom. It was written as a practical guide in layman’s language for the layman who, like me, would like to know more about how to care for his body and maintain good health. We are in a health crisis in America today. Americans are spending almost one trillion dollars per year on health care and approximately 70% of our population is overweight. More money is being spent on cancer and heart research than ever before and yet more people are dying from cancer and heart disease than ever before. “Between 1776 and 1941 the U.S. government spent 80 million dollars on health care and health care research and studies. As of 1994, the U.S. government is now spending 1.2 trillion dollars per year on health care” (Wallach, “Dead Doctors Don’t Lie,” recorded message, 1995). “Even though more people seem concerned about health than ever before, the general health of the nation is not very impressive. For example, deaths from cardiovascular, cancer and pulmonary causes amount to more than 70% of total deaths in the country each year. This fact becomes even more startling when combined with a statement from the Surgeon General’s office that indicates that two-thirds of all deaths in our country are premature! Think about that for a moment. Two-thirds of all deaths are premature!” (Stuberg, The 12 Life Secrets, pg. 65). Most people greatly underestimate the damage that is done to the human body by preservatives, overeating, prescription drugs, cigarette smoke, refined foods, inactivity, and alcohol. Many wake up only after irreparable damage has been done. Eight people have died on our street within one block of my home during the last twenty years. Two died from emphysema, three died with heart disease, two died with cancer, and one took her own life because her husband left her. In all but one case, the quality of their lives was at an all time low during the last ten years of their lives. Hundreds of thousands and maybe millions of dollars were spent on medical treatments and surgeries which seem to do little or no good. There must be a better way. Quite often I learn of a missionary who had to leave the mission field and return to the U.S. because of health problems. I also hear of pastors who must leave the ministry because of failing health. I become sick at heart when I learn of people at church who will be receiving medical treatment or surgery because of health problems. The reason I become sick at heart is because I know that others who have followed this same course of treatment have received little or no help. It is like the woman in Mark 5:25-34 “And a certain woman, which had an issue of blood twelve years, and had suffered many things of many physicians, and had spent all that she had, and was nothing bettered, but rather grew worse, when she had heard of Jesus came in the press behind, and touched his garment. For she said, If I may touch but his clothes, I shall be whole. And straightway the fountain of her blood was dried up; and she felt in her body that she was healed of that plague. And Jesus, immediately knowing in himself that virtue had gone out of him, turned him about in the press, and said, Who touched my clothes? And his disciples said unto him, Thou seest the multitude thronging thee, and sayest thou, Who touched me? And he looked round about to see her that had done this thing. But the woman fearing and trembling, knowing what was done in her, came and fell down before him, and told him all the truth. And he said unto her, Daughter, thy faith hath made thee whole, go in peace and be whole of thy plague.” I believe that prevention of disease through diet and simple lifestyle changes is much better than costly surgery, radiation, and medication that may not even help. Please accept responsibility for your own health and think for yourself. I pray that this “food for thought” will result in your enjoying the health that God plans for you, “Beloved, I wish above all things that thou mayest prosper and be in health, even as thy soul prospereth” III John 2.